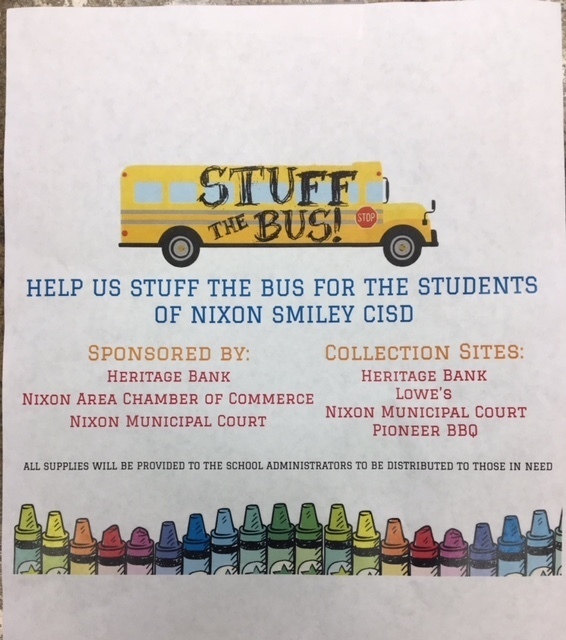 Nixon-Smiley CISD would like to thank Heritage Bank for organizing a "Stuff the Bus" drive for school supplies. Heritage Bank was joined by the Nixon Area Chamber of Commerce, Nixon Municipal Court, Lowe's Market as sponsors and by Pioneer BBQ as a collection site. We also appreciate the many individuals who donated back packs, notebooks, pens, and many other types of supplies. Your generosity will ensure that all students have what they need to get the school year started. Although Nixon-Smiley CISD has made an effort to cut back on our school supply lists over the years, some things can not be avoided. And for some families, we know that even the purchase of new school shoes can be really difficult in an already tight budget. Adding in the cost of backpacks, paper, pens, and other necessary items can sometimes be beyond their means. So this effort is really appreciate. The supplies will go directly to the children who otherwise would be going without. Thank you so much to all involved!! Pictured above: Students at Nixon Smiley Elementary receiving school supplies from Mrs. Atkins, principal. 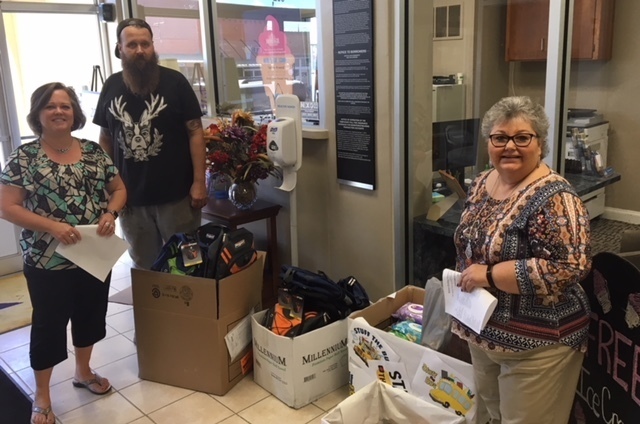 Pictured above: Dr. Cathy Lauer, Superintendent NSCISD, Cathy Hilton, Vice-President of Lending at Heritage Bank and Shawn Collins, Owner, Pioneer BBQ.